I had no expectations before reading this book, but was left very impressed by the end. It didn’t just tell a story but had many very interesting asides involving the characters and their thoughts. The analysis of how death is viewed in different societies was thought provoking – Szerb obviously was a very knowledgable man and you can tell. I particularly liked that the characters constantly changed. For a few pages you would think you had a handle on the absolute of one of the participants, a truth would be discovered, but then everything would change. This is a marked difference to the usual novels where each character has a core and once you discover what it is then this purpose forms the story and the actions. 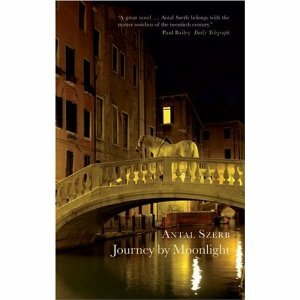 Not so with Journey by Moonlight. The irony is that much of the story relies on coincidences that you can see coming, which does give a surreal, fantastical edge to the action. However, despite such foresight you never really know how each character will respond to what has been set up. This was a very unusual book and at times I felt a little out-to-sea because of the inconstancy of the characters. I have to admit I liked this and part of the novel’s intrigue was how the characters would change and act. The ending was perfect and the final sensation was that I had just eaten a sumpuous dinner with many fine flavours, the brandy at the end hinted at the evening ahead. Soundtrack: anything off the Eels ‘Tomorrow Morning‘ album.